The Exhibitor and Advertiser Prospectus for the 2017 Annual Conference in New York is now available for download. Featuring essential details for participation in the Book and Trade Fair, the booklet also contains options for sponsorship opportunities and advertisements in the Conference Program and on the conference website. Printed copies of the prospectus will be available at the end of August. 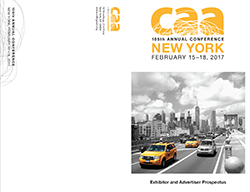 The Exhibitor and Advertiser Prospectus will help you to reach a core audience of artists, art historians, educators, students, and administrators, who will converge in New York for CAA’s 105th Annual Conference, taking place February 15–18, 2017. 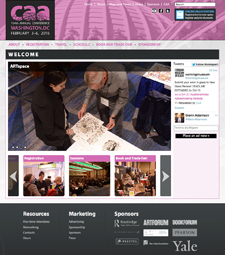 With three days of exhibit time, the Book and Trade Fair will be centrally located in the New York Hilton Midtown. CAA offers several options for booths and tables that can help you to connect with conference attendees in person. The priority deadline for Book and Trade Fair applications is Monday, October 31, 2016; the final deadline for all applications and full payments is Friday, December 9, 2016. In addition, sponsorship packages will allow you to maintain a high profile throughout the conference. Companies, organizations, and publishers may choose one of four visibility packages, sponsor specific areas and events, or work with CAA staff to design a custom package. Advertising possibilities include the Conference Program, distributed to over four thousand registrants and press contacts in the conference tote bag, and the conference website, seen by tens of thousands more. The deadline for sponsorships and advertisements in the Conference Program is Monday, December 5, 2016; web ads are taken on a rolling basis. Questions about the 2017 Book and Trade Fair? Please contact Paul Skiff, CAA assistant director for Annual Conference, at 212-392-4412. For sponsorship and advertising queries, speak to Anna Cline, CAA development and marketing assistant, at 212-392-4426. The website for the 104th Annual Conference in Washington, DC, to be held from Wednesday, February 3 to Saturday, February 6, 2016, at the Washington Marriott Wardman Park Hotel, is live today. Get a taste of conference highlights and discover the benefits of registration, including access to all program sessions and admission to the Book and Trade Fair. The dynamic energy of Washington, DC—known for its world-class museums and as an international destination for American history and culture—provides the backdrop for our annual gathering of more than four thousand artists, art historians, museum directors and curators, arts administrators, scholars, and educators. Look forward to the best in new scholarship, innovative art, and in-depth discussion of issues in the visual arts today. Highlights of this year’s conference include the presentation of CAA’s 2016 Awards for Distinction, an opening reception at the Katzen Arts Center at American University, and the sixteenth annual Distinguished Scholar Session honoring Richard J. Powell of Duke University. The two Distinguished Artists’ Interviews will feature the sculptor Joyce Scott, speaking to the curator George Ciscle. Among the highly anticipated sessions are: “South to North: Latin American Artists in the United States, 1820s–1890s,” chaired by Katherine E. Manthorne; “Transforming Japonisme: International Japonisme in an Age of Industrialization and Visual Commerce,” led by Gabriel P. Weisberg; and the two-part “Formalism before Clement Greenberg,” chaired by Katherine M. Kuenzli and Marnin Young. Other exciting session topics range from art as adventure to the Hudson River School, from digital cultural heritage to algorithms and data in contemporary art, and from diversity in curatorial work to staging design in museums. Online registration for individuals and institutions is now open. In addition, you can book your hotel reservations and make your travel arrangements—don’t forget to use the exclusive CAA discount codes to save money! Register before the early deadline, December 21, 2015, to get the lowest rate and to ensure your place in the Directory of Attendees. You may also purchase tickets for special events and for a place in one of eleven professional-development workshops on a variety of topics for artists and scholars. CAA will regularly update the conference website in the months leading up to the four-day event, so please be sure to check back often. Averaging more than 40,000 unique visitors per month, the conference website is the essential source for up-to-the-minute updates regarding registration, session listings, and hotel and travel discounts. Visit the Advertising section to learn more about reaching CAA membership and conference attendees. 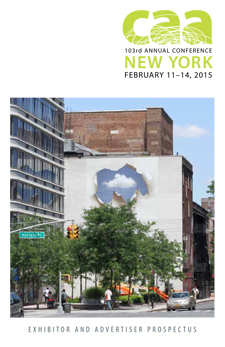 The Exhibitor and Advertiser Prospectus for the 2015 Annual Conference in New York is now available for download. Featuring essential details for participation in the Book and Trade Fair, the booklet also contains options for sponsorship opportunities and advertisements in conference publications and on the conference website. 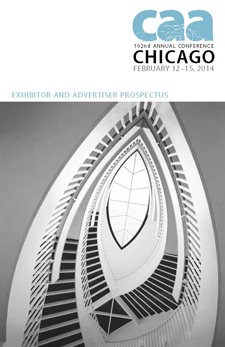 The Exhibitor and Advertiser Prospectus will help you reach a core audience of artists, art historians, educators, students, and administrators, who will converge in New York for CAA’s 103rd Annual Conference, taking place February 11–14, 2015. With three days of exhibit time, the Book and Trade Fair will be centrally located at the Hilton New York, where all programs sessions and special events take place. CAA offers several options for booths and tables that can help you to connect with conference attendees in person. The priority deadline for Book and Trade Fair applications is Friday, October 31, 2014; the final deadline for all applications and full payments is Monday, December 8, 2014. In addition, sponsorship packages will allow you to maintain a high profile throughout the conference. Companies, organizations, and publishers may choose one of four visibility packages, sponsor specific areas and events such as the Student and Emerging Professionals Lounge, or work with CAA staff to design a custom package. Advertising possibilities include the Conference Program, distributed to over five thousand registrants in the conference tote bag, and the conference website, seen by thousands more. The Conference Information and Registration booklet is digital-only for the first time and a great opportunity to feature color ads that link directly to your website. Web ads are taken on a rolling basis, but the deadline for inclusion in the Conference Information and Registration booklet is Friday, August 29, 2014. The deadline for sponsorships and advertisements in the Conference Program is Friday, December 5, 2014. Questions about the 2015 Book and Trade Fair? Please contact Paul Skiff, CAA assistant director for Annual Conference, at 212-392-4412. For sponsorship and advertising queries, speak to Hillary Bliss, CAA development and marketing manager, at 212-392-4436.